This timely project explores the experiences and contributions of child refugees in Australia since 1920 and examines how these are connected to Australia’s evolving international role on refugee and migration policy. How can our past inform current and future approaches to humanitarian immigration? The chief investigator is Professor Joy Damousi of the School of Historical and Philosophical Studies, who was awarded an Australian Research Council (ARC) Kathleen Fitzpatrick Laureate Fellowship to lead the research. She works with postdoctoral research associate Dr Mary Tomsic, postdoctoral research fellow Dr Jordana Silverstein, administration assistant Dr Alexandra Dellios, research assistant Dr Rachel Stevens, and PhD candidates Sarah Green, Anh Nguyen, Niro Kandasamy, and Samuel Malak. The Fellowship, which began in December 2014, lasts five-years to accommodate the scale and scope envisaged by Professor Damousi. It aims to leave a legacy, build capacity, and develop a new research strength in refugee history. Professor Damousi was led to the project after studying children's experiences of the Greek Civil War of 1945-49. This research prompted her to ask "what was Australia's role on the world stage in relation to child refugees more broadly, and what does that tell us about Australian internationalism?" Professor Damousi explains that this topic has received little attention. "It struck me that there has been quite a bit done on refugees in Australian history and quite a bit done on children in Australia, but no-one's really brought the two together. The idea was to bring together two historiographies." Each researcher within the Fellowship has a specialised field. Professor Damousi will write a history of child refugees in Australia from 1920 to 1970. The four PhD students focus on the experiences of child refugees from Bosnia, Sudan, Sri Lanka, and Vietnam. The postdoctoral fellows are pursuing wider thematic research: Dr Silverstein examines public policy towards child refugees through a cultural frame and Dr Tomsic studies the visual representation of child refugees. Two of the doctoral researchers describe the significance of their projects. Sarah Green studies Bosnian child refugees. "One of the things I'm particularly interested in is how the narratives constructed about Bosnian children during the war contrast with what Bosnian children remember about their own stories." Niro Kandasamy, who is a former child refugee, examines the long-term resettlement experiences of Sri Lankan Tamils. "We don't know how they maintain their ethnic identity, how they acculturate in a resettlement context. It's very important in the current context with a lot of Tamils arriving as refugees - we need to know about their histories, memories, and challenges as well as what's been working." There will be considerable outputs from this research. All the researchers will be aiming to produce articles and books, including co-authored material. "One of the great things about this project is the opportunity to collaborate," says Ms Green, "which is so rare in the Humanities and I wish it was a model we saw more often." The Fellowship involves wide engagement and outreach. 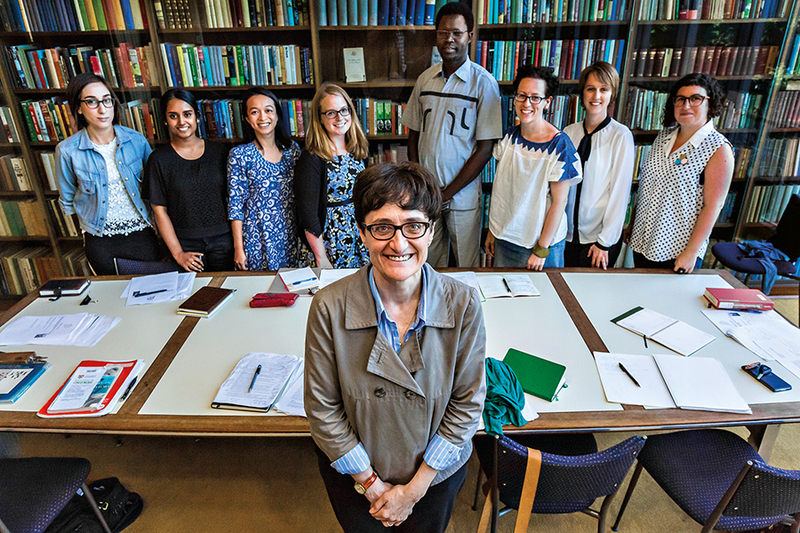 There is a mentoring scheme, where Professor Damousi provides training to women early career researchers in the humanities and social sciences. A Refugee History Network has been established under the auspices of the Laureate. "It aims to get more scholars to talk to each other about refugee history and it's growing well," says Dr Dellios. There will be conferences associated with the Fellowship; the first, "Global Histories of Refugees" in October 2016, featurred a keynote address by Gillian Triggs, President of the Australian Human Rights Commission. Professor Joy Damousi, ARC Kathleen Fitzpatrick Laureate Fellow, Professor of History, The University of Melbourne. For more information about the project please email KFLaureate-Fellowship@unimelb.edu.au.